Traditional networking isn’t working. This groundbreaking book flips the classic idea of networking on its head. Helpful revolutionizes how we think about networking, how it happens, and how we should do it. Some people believe that networking is about making the right connections to get a new job or collect social capital. Helpful reveals that networking is much more than just meeting new people; it’s about embracing the world with a spirit of helpfulness to freshen and strengthen the connections with the people you already know. Readers will learn to master the ultimate networking question (and how to deal with the world’s worst networking question! ), networking strategies for introverts and extroverts, the nuts and bolts of using LinkedIn to build a network, and much more. 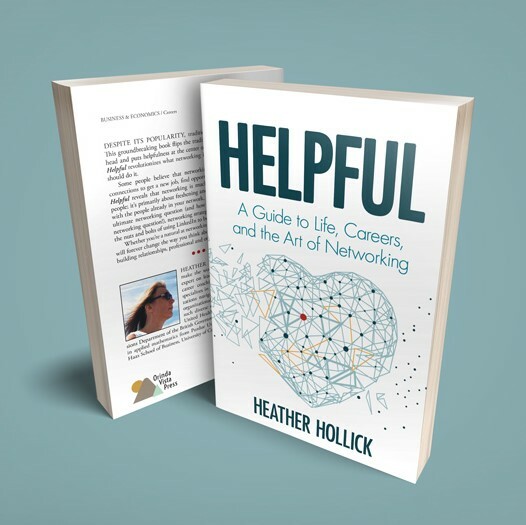 Helpful is a four-part journey into the world of professional networking. Part I — Preparation, makes the case for networking and tells how it grew out of Heather's life experience and ineptitude at savvy networking. Part II — The Networking Mindset, defines how to think about networking, framing it in a way that makes it natural and inviting. Part III — Networking in Action, takes the newfound mindset for networking and puts it into practice across a variety of scenarios ranging from your LinkedIn profile to effectively working a room at conferences and large events. Finally, Part IV — Networking at Work, shows how our basic mindset of networking applies within teams and organizations, becoming an a valuable career tool and a transformational cultural norm. Whether you’re a natural at networking or dread it like tax day, Helpful will forever change the way you practice networking and building relationships, professional and otherwise. Helpful is also available at bookstores and libraries worldwide. You may have to ask the clerk or the librarian. Effective networking and the appropriate nurturing of relationships is of utmost importance in so many aspects of business. Heather’s book is a unique combination of meaningful theory and quality, specific instruction. Heather lives and breathes this subject — her passion should be your guide. Heather Hollick speaks eloquently to those who do not have a network and are unsure of how to build one. The detail that she provides is impressive. If you are an introvert, you may feel that the first several chapters are talking directly to you. Regardless of whether you are an introvert or extrovert, this book provides a roadmap – with real world examples and practical tips – for creating your own network. This book is a must read for anyone seeking to build and grow connections with others both within and outside organizations.